Up To 70% Off on Clovia. Up To 50% Off on Beauty Products from Top Brands. Up To 50% Off On Studio Voylla. Up To 50% Off On Bag & Clutches. 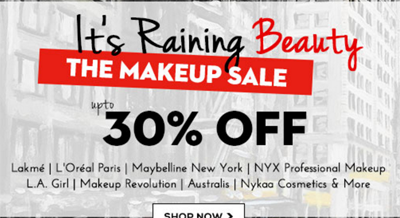 The Monsoon Store @nykaa Up To 40% Off . Makeup Focus Sale Up To 30% Off. Up To 25% Off Face Canada Skin. The Summer Store - Up To 25% Off Summer Makeup Products. Flat 20% Off + 5% Off. 20% Off Lakme Steal Deals. Get 33% off sitewide + free 16 color eyeshadow palette with any purchase. Get free shading eye trio brush set on all orders $20+. L'Oreal Paris White Perfect Day + Night Cream With Free Travel Pouch. Faces Ultime Pro Eye Shadow Duo As Low As Rs.487. BH Liquid Foundation at Just $2.99.Limited time offer. Enjoy a free afternoon rendezvous 16 color eyeshadow palette with sitewide purchase. Get a free midnight affair 16 color eyeshadow palette with any purchase. Limit one code per purchase per customer. All for just $4.Lipstick，lip tint，foundation，concealer are included. 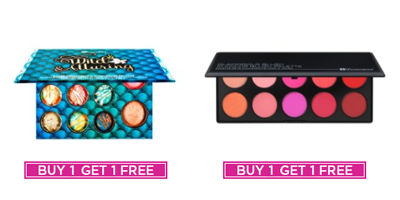 Buy 1 get 1 free on these 12 sumptuous palettes.No coupon code required. Add $10 of eligible products to your cart to receive free gift and free ground shipping within the continental United States. International orders will receive a $7 shipping credit.